PUT ON YOUR HARD HATS FOR THIS DISCOVERY CHANNEL SERIES -- AN INSIDE LOOK AT SOME OF THE BIGGEST, MOST COMPLEX AND TREACHEROUS CONSTRUCTION PROJECTS AROUND THE GLOBE IN AN 8-DVD MEGA SET! Put on your hard hat for an exciting and stimulating all-access look behind the scenes of the biggest and most intriguing construction and engineering projects being tackled around the globe today. Perfectly timed for Father's Day gift giving, this boldy-constructed set provides exclusive construction zone access to the most sophisticated and elaborate engineering projects ever attempted. 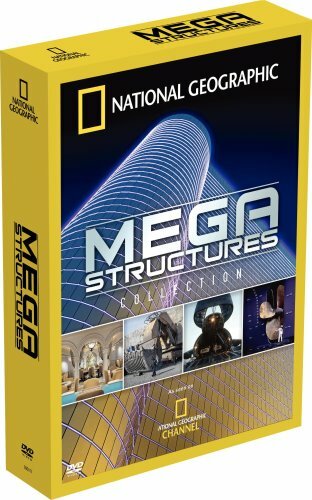 Including incredible behind-the-scenes footage, computer-generated models and in-depth interviews with the project designers and builders, themed episodes include "Mega Machines", covering everything from oil rigs to national railways; "Mega Bridges", featuring some of the world's largest spans from New York to Saigon; "Mega Earth", which covers everything from man-made islands to spectacular ice hotels and "Mega Excitement", covering amusements parks to stadiums.